For Children- A Storm is Coming! On the 20th January, Cockburn SES and the Jandakot Volunteer Bush Fire Brigade went to Bunnings Cockburn Central for the annual Emergency Services Fundraiser. The day is always a great one with Bunnings firing up the barbie for a big sausage sizzle! Lots of City of Cockburn locals popped down for lunch, and talked emergency preparedness while the kids practiced what phone numbers to call in an emergency, visited the bouncy castle, and took some SES colouring in! 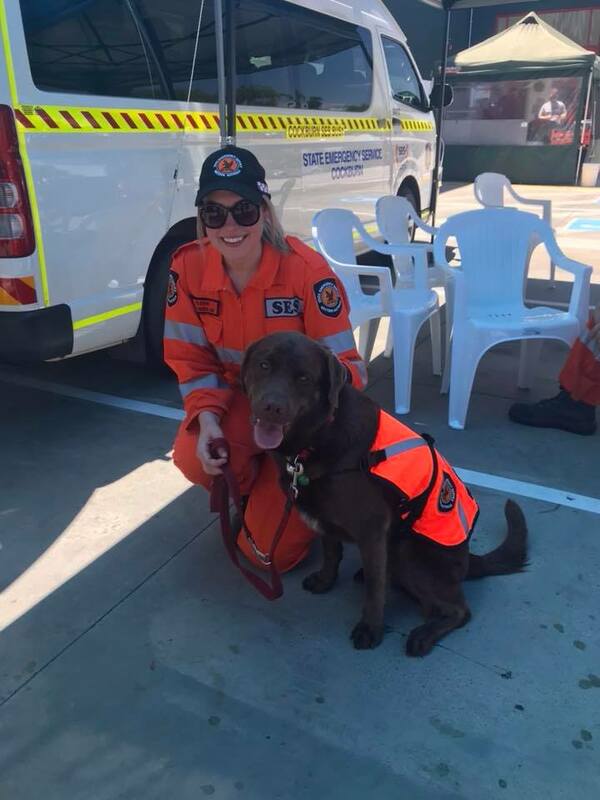 Cockburn SES Volunteer Elesha also met a new friend ‘Stan’ from the SES WA Search Dog Unit who came to visit and support the cause. Many thanks to Bunnings Cockburn Central for helping to fundraise for the volunteer emergency services! This entry was posted in Events by Erica. Bookmark the permalink.